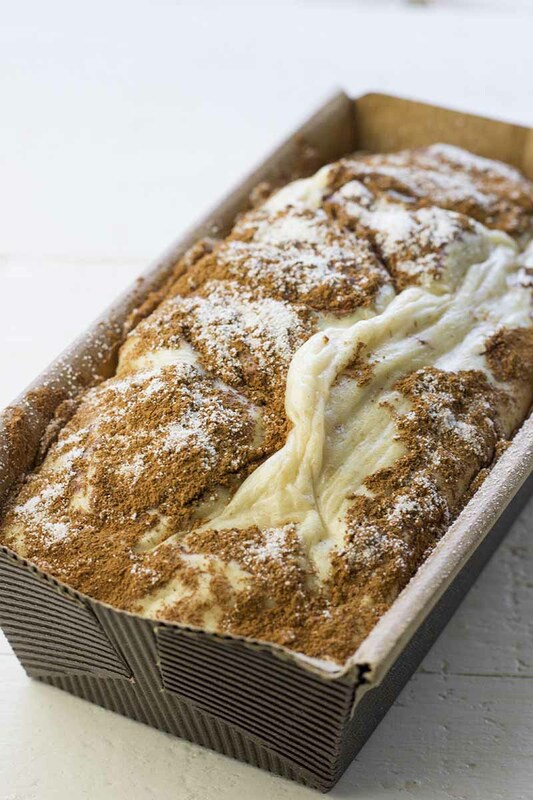 With this Cinnamon Swirl Protein Cake, you can have cake for breakfast! It’s a tasty, high-protein treat that will make you excited to get out of bed in the morning. I don’t know about you, but I love a breakfast that reminds me of dessert! There is something so fun about crawling out of bed in the morning and starting my day with a sweet treat. I guess that’s why people love to wake up and have a big breakfast of waffles or pancakes drowning in syrup, right? However, as someone with diabetes, eating sugary pancakes smothered in sugary syrup is not a good breakfast option. In fact, it’s not exactly a good breakfast option for anyone (even if it tastes great going down!). I like to eat breakfasts that are high in protein and have a moderate amount of low-glycemic carbs and healthy fats. 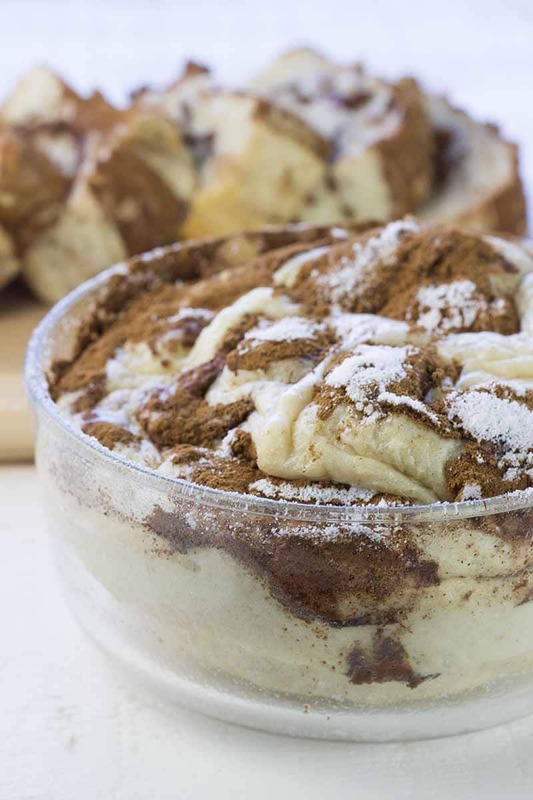 That’s why I created this nutritious (and very delicious) Cinnamon Swirl Protein Cake. Yes, cake for breakfast! As you might expect with the name, this recipe has a ton of protein (34 grams), and it also has a moderate amount of carbs (18 grams) and fat (2 grams). There are only 217 calories in the entire protein cake recipe, so it’s a healthy, low-calorie breakfast option. 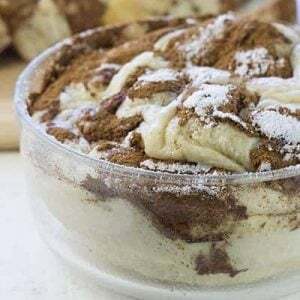 I love to make Cinnamon Swirl Protein Cake in a small loaf pan because I can slice it up and eat one slice at a time, but you can make it in any oven-safe dish you want. As you can see in the photos, it also bakes great in a small round glass baking dish! One thing I really love about this recipe is it stores so well in the fridge. If you’re rushing around most mornings like I am, you probably appreciate a breakfast that you can make the night before and just pop in the microwave the next morning. This recipe is perfect for that—if you store it in the fridge, you can warm it up in the microwave in only 30 seconds. It tastes good and it’s convenient. Talk about a win-win! Even though I told you this makes a healthy, low-calorie breakfast, that shouldn’t hold you back from eating it as a snack or dessert. With the high protein content (thanks mostly to the vanilla protein powder), it’s a great way to increase your protein consumption any time of the day. If you want to get a little decadent for dessert, you could spread a thin layer of almond butter on a slice. Yum! Although you might be tempted, don’t increase the ingredients and try to make a “giant loaf” for a bunch of meals. If you do that, it doesn’t get cooked all the way through… and the last thing you want is a mushy protein cake! Use the right protein powder. You want a protein powder that is suitable for baking and has a strong vanilla flavor. I use Met-RX Vanilla Protein but other brands should work as well. If you try this recipe and it doesn’t come out right, try changing your protein powder. If you want to try more of my protein baking recipes, check out my Protein Pancakes and Protein Berry Crumble. Both recipes are packed with protein (more than 20 grams per serving) and taste AMAZING! You can also take a look at my roundups of the best low-carb breakfast ideas for diabetics and diabetic desserts for more great low-carb recipes. When you’ve tried this healthy protein powder cake, please don’t forget to let me know how you liked it and rate the recipe in the comments below! 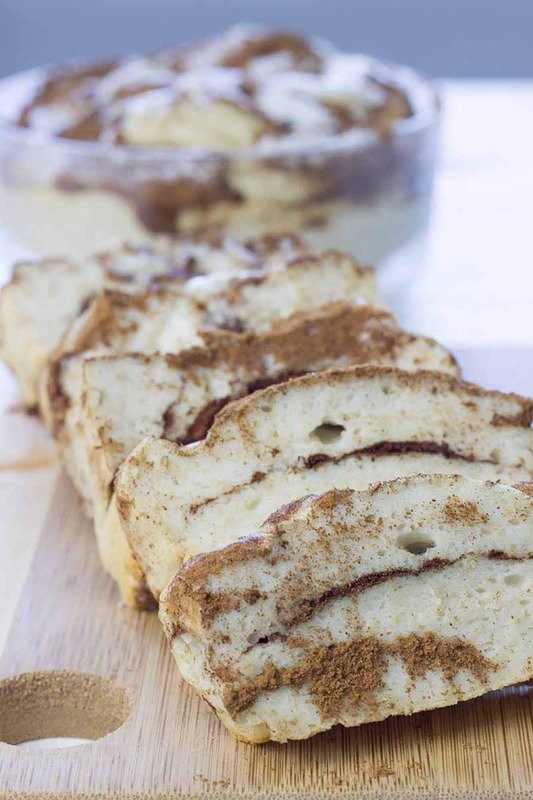 Have dessert for breakfast with this delicious Cinnamon Swirl Protein Cake! It’s high in protein, easy to make, and stores well in the fridge. Pour the mixture into a bowl and whisk it together with the protein powder and 1 tsp. Stevia (the mixture should be like thick pancake batter). Pour half of the batter into a small (about 4.5 inches across) nonstick pan and sprinkle with two-thirds of the cinnamon and 1 tsp. Stevia. Pour the remaining batter over and sprinkle with the rest of the cinnamon. Pull a knife through the batter a few times to slightly mix in the cinnamon and Stevia. Bake for 25 minutes and let it rest for a few minutes before serving. If stored in the fridge, reheat for 30 sec in the microwave before serving. Has anyone tried doubling or tripling the recipe and making into muffins? It looks like icing or yogurt in the picture are you adding that to the dish or does it just look like that? I am allergic to Stevia. Would Splenda or another powder-type sweetener work as well in your recipes? could i leave out the oats entirely to make it even more low carb? The only stevia I have are NuNaturals stevia packets. Is this the right stevia to use? Thanks, I can’t wait to try this! Where do you find vanilla powder?? If making just the one serving, what kind or size dish am I baking it in? Good question. The one we use is about 4.5 inches across. I have added that to the recipe description. I just made this. It taste pretty good but my texture looks nothing like yours. Mine is very dense and thick, while I feel like yours looks more light and fluffy (like a cake). Should the recipe have baking powder in it to make it rise? Mine is flat. Hope you can offer me some advice on this. Thank you in advance!! It might be the protein powder you use. I use a brand called Met-Rx Protein plus for baking and that acts pretty much like flour. If the texture and taste are good with your current product you could try and add a little baking powder, I haven’t tried that, but don’t see any harm in adding some. I’m thinking of using this for weekly meal prep. Is it possible to multiply the recipes, cook in a small casserole dish, and then slice it up into portions for each day? It would be for both the hubby and me. Thanks! Yes, that’s not a problem and something I’ve done before. This maybe a dumb question , but when u say mix do u mean in a blender ? Or a mixer ? I had the same question. Hope we get an answer.???? Step 2 is in a bender. After that, you just have to gently whisk everything together in step 3..
HI there!! What approximate size is a serving?? And how many servings does one batch make? Thanks ? Hi Rebecca, the recipe is for 1 serving. Each serving is about the size of a burger bun so it’s a good sized snack. I have Isofemme Vanilla protein powder and the scoop is quite large. Approximately how much is your scoop? Also would any kind of oats do? Our scoops are 1 oz. (28.5g). We use Old Fashioned Oats, but any kind of rolled oats should work. Hi there! I was wondering about the kind of oats? I tend to have stone ground in the house but is that too thick/slow cooking? Stone ground oats, steel cut oats and old fashioned oats are almost identical when it comes to nutrients and glycemic index. They are all great! The main difference is that stone ground and steel cut oats need to cook a lot longer than old fashioned oats, so you can’t use them in our baking recipes without cooking them a little first. The oats you want to avoid are instant oats and similar highly processed types where most of the nutrients are gone.